We support the functioning of society and the provision of local services in all countries in which we operate by way of paying taxes and creating jobs. The taxes and tax-like fees paid and remitted by Neste were a significant source of income to public administrations also in 2018, when we supported the societies altogether with 4.0 billion euros. The countries in which we operate also benefited from the income taxes paid by our employees. We comply with the applicable local legislation in paying, collecting, remitting, and reporting on taxes and fees. We are committed to following the OECD Transfer Pricing Guidelines, and we pay and collect taxes in countries where our value-added activities are born as a result of our investments and personnel. Neste promotes cooperation with tax and customs authorities. In compliance with Neste’s Human Rights Principles, Neste encourages social progress and development that is in the public interest, including transparency, accountability and prohibition of tax abuse. Our data on payment of taxes in 2018 has been compiled taking into account the points of view of materiality, confidentiality, business reasons, and cost-effectiveness. Our President and CEO is ultimately responsible for decision-making regarding decisions on tax affairs at Neste. Significant tax planning measures and decisions are only implemented following the approval by the Board of Directors. Our operational tax organization is divided into the tax organization at Neste’s head office and local financial organizations operating outside Finland. High-quality tax returns and reports are the cornerstone of our management of tax affairs. We complete tax returns carefully in accordance with the applicable local laws and regulations and submit them by the deadline without undue delay. All communication and contacts with the tax authorities are honest, respectful, and professional. Neste has companies operating in Bermuda and Guernsey for business-related reasons. Even though these are low-tax countries, Neste Corporation pays income tax on the result of the insurance company operating in Guernsey to Finland. The income of the shipping business of the affiliated company in Bermuda is taxed in accordance with Finnish tax legislation when funds are repatriated to Finland. Neste has four fully-owned companies and one subsidiary (51%) in the Netherlands. Two of them are part of the historical legal structure of Neste, and subject to statutory taxation in the Netherlands. Neste Engineering Solutions Oy has a wholly owned Dutch entity in the Netherlands. This company and the subsidiary (51%) are also subject to statutory taxation in the Netherlands. Please, see below Neste Netherlands BV for its advance pricing agreement. Furthermore, many countries offer different types of incentives for companies. In the following countries where Neste has business operations, Neste benefits from the local tax treatments offered to companies based on local legislation and practices. Belgium has a general income tax incentive available to locally established companies. Former base oils refinery company Neste N.V. conducts base oils customer service operations in Belgium with a headcount of some 20 persons. Furthermore, Neste has a representative office in Brussels. Neste Netherlands BV operates a wholly-owned renewable refinery in Rotterdam with some 140 employees. The company has concluded an advance pricing agreement with the Dutch tax authorities on the income taxation of the company. Neste's refinery investment regarding the refining of its renewable products is considered to qualify as a pioneer activity as prescribed under the applicable Singapore legislation. Such pioneer incentive is an investment incentive for new, substantive economic contributions, which must include commitments to significant incremental capital expenditure, business spending, and creating of skilled jobs in Singapore, as well as anchoring leading-edge technology, skills or activities in Singapore. Income derived from the production of certain Neste's renewable products refined in Singapore are tax exempt until 2023. Other income beyond renewable production, for example income from supply services, is taxed at a statutory tax rate of 17%. Neste has over 130 employees in Singapore. Neste (Suisse) S.A. employs over 50 persons in sales and marketing functions in Switzerland. Neste pays cantonal and federal income tax in Switzerland annually at some 13%. Neste Engineering Solutions Oy has business operations with some 70 employees in Abu Dhabi, United Arab Emirates. Neste, Bahrain Petroleum Company B.S.C. and Oil & Gas Holding Company B.S.C. have a joint base oils refinery in Bahrain. Neste obtained a disadvantageous tax judgement in Bahrain in 2018 and has appealed against it. As part of an impairment process, Neste has written down all Neste Oil Bahrain W.L.L. 's assets. Neste is currently engaged in arbitration with the Bahrain base oil joint operation partners concerning a contractual dispute. The task of the tax organization is to offer feasible solutions to support the Group’s business. This aims to ensure that we do not pay double or triple taxes on our business operations. Our tax planning is focused on business changes and implementing the Group’s business strategy. Read more about our tax strategy. The table presents the essential taxes and tax-like fees which we are liable to pay or collect in accordance with the local legislation. Payments to Finland and other countries are presented by tax type. 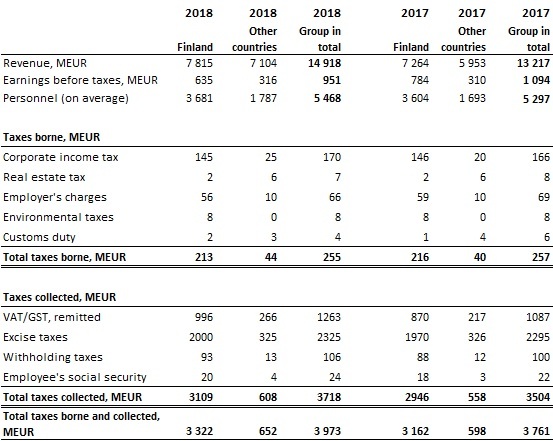 From the point of view of materiality, the table presents our global key tax figures, which indicate the significant weight of Finland and the high amount of indirect taxes. Data on other countries is presented combined for competition-related reasons to maintain the confidentiality of our business data. Neste does not report any tax expenses related to its equity accounted investments in the line Income tax expense of the Consolidated Financial Statements. The net income of equity accounted investments is reported in the line Share of profit (loss) of joint ventures. This approach is in alignment with IFRS. The international definition of public subsidies is vague and very broad; therefore, we have not included public subsidies in our report. For example, the Blender’s Tax Credit (BTC) in the United States improved Neste’s comparable operating profit in 2018 but not in 2017. Taxes and fees included in the purchase price of a product or service, and for which we do not have a statutory reporting obligation, are not included in the summary data. If our foreign Group company has paid taxes to Finland, such taxes are presented in the figures for Finland and not in the corresponding figures for other countries. This tax footprint report is part of the sustainability reporting within Neste’s Annual Report. Value-added taxes, remitted – Net value-added tax rendered for to states, i.e. taxation for value-added tax to be paid and deducted for the tax periods of the financial year. Value-added taxes include corresponding sales taxes. Withholding taxes – Tax collected on salaries, dividends, royalties, and interest on behalf of the actual taxpayer, such as a natural person or a company. Collected taxes – Taxes collected by Neste as prescribed by law and rendered for to states or other public administration on behalf of the taxpayer, such as tax withheld in advance from employees’ salaries. Real estate tax – All taxes and fees for which liability to pay arises from the ownership, occupation, and/or use of properties or other similar assets. Taxes borne – Taxes and fees that Neste must pay to states or other public administration as prescribed by law. Customs duty – Statutory customs duties paid on imports and exports, paid to the EU or states of another customs territory during the financial year. Excise duties – Taxes rendered for to the state for the tax periods which must be collected when certain products are handed over for consumption or taken into use. Excise duties also include stockpile fees. Taxes – Essential and mandatory taxes, fees, and other obligations levied by the state or other public administration. In addition, statutory pension contributions are included in employer’s contributions and employee’s social security contributions regardless of whether the payment was made to the state or other public administration. Corporate income tax – All income taxes recorded on the result for the financial year and income taxes recognized during a calendar year as a result of adjustments to income for previous financial years (does not include deferred taxes). Environmental taxes – Taxes and fees levied due to environmental impacts.